For some time I have found the render dialogue slightly counter-intuitive, especially the order and way the options are presented. I take the liberty to suggest a small modification that IMHO improves this. 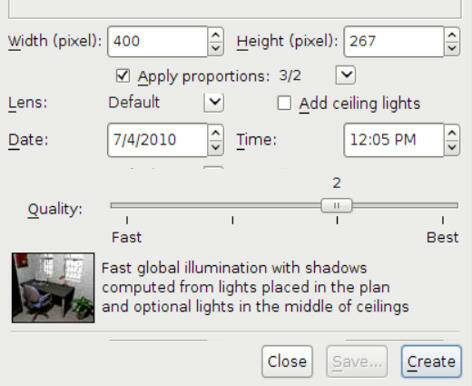 Ideally the "lens" and "add ceiling lights" options are interchanged, so that the two check-boxes line up. PS: This was done in my word processor, and I couldn't make the check-boxes to line up properly. I chose to layout the new options at bottom because they are not available at the two lowest quality level. Thus, the quality slider is always at the same place when the options are displayed or hidden between quality 2 and 3, and the user can keep on using it without moving the mouse pointer.